DJ just picked up his third foul. Not a good play for Jordan, who picks up his third foul. Davis also has three. That's not at all good for the Clippers. Kevin Durant makes two free throws and suddenly the Clippers only lead by three points, 34-31, with just under 10 minutes remaining in the first half. Granger trying to make something happen offensively for the Clippers and gets to the line. He makes two to increase the lead to 36-31 and stall OKC a bit. 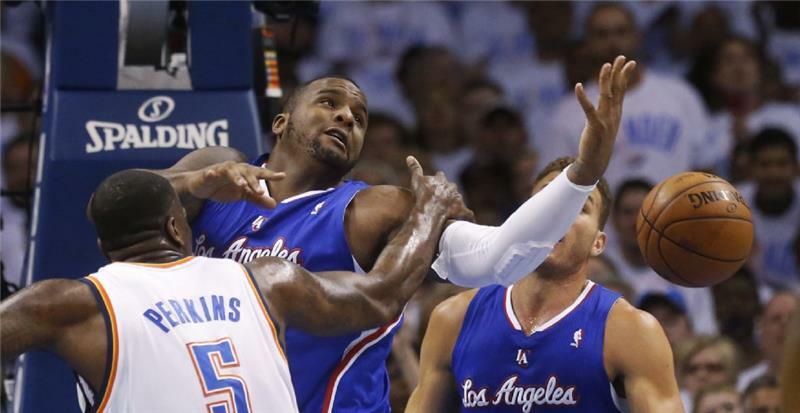 Clippers forward Glen Davis and Thunder center Kendrick Perkins reach for the ball in the first quarter of Game 5. OKC is on a 16-5 run. They're 18-for-21 from the free throw line. The Clippers have only shot 10 free throws. Breaking news: First quarter leads don't mean much in this series. The MVP. it's two points, and yet another Clippers miss. Then the D picks up and Granger hits a banker. He's beginning to play like the guy they hoped they had signed. This is what happens when CP3 is on the bench. The Clippers are sorely missing their general out there right about now. Thunder battles back. Durant/Jackson connect from 3. It's now a 1-point game. 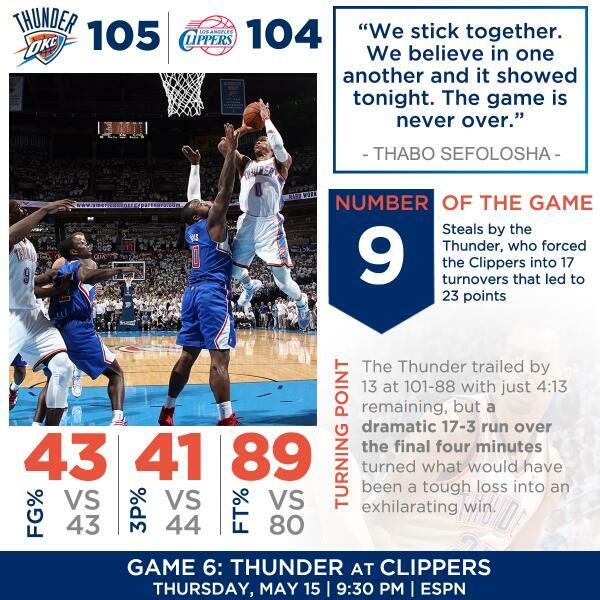 OKC D forces 7 LAC turnovers. @NBAonTNT #ThunderRadioNetwork . @melissa. Yeah, on the problems with Chris Paul out of the lineup. The ball isn't moving the way it was. He needs to be on the floor, oh, every minute. Russell Westbrook as he goes up for a shot in the first quarter. @mike: Exactly. Also the Clippers are having a total defensive break down, and are relying on fouling, which clearly isn't working considering the Thunder is 18-for-21 from the free throw line. Durant feeds Steven Adams for the dunk. Thunder UP 39-38 with 7:35 left in Q2. Paul is back in with 8 minutes in the half, but Durant feeds Adams for a dunk for a 39-38 lead, OKC's first lead since 2-0. The Clippers, who led by as many as 15 points this game, are now tied with the Thunder at 38-38 with 7:35 left in the first half. Adams is just the kind of player every player in the league would like to have on his team and every player in the league hates playing against. Fouls are becoming an issue. Ibaka picks up his third. Jordan and Davis also with three. Granger then hits from 25 feet straight on and the Clippers are back on top. Granger could be the x-factor tonight. He has 7 points so far, on 2-fot-3 shooting.